Cody Canada has had quite a ride over the last 18 years. He fronted Cross-Canadian Ragweed for over 15 years, releasing I believe 7 studio albums and 3 live albums. Upon Ragweed's unfortunate decline, Canada loaded himself into a sling-shot and fired himself full-force into a new venture with 4 other amazing musicians forming Cody Canada and The Departed. Within a very short time they were tearing up stages with as much energy and confidence as a band that had been together for many years. They primarily played a selection of Oklahoma songwriter covers from the likes of Mike McClure, Tom Skinner, Kevin Welch and many others, but also mixed in a fair amount of Seth James and Cody Canada originals as well as a few select Ragweed tunes. The band soon ventured into the studio and threw down their first record which was an amazing 20 song tribute to Oklahoma songwriters titled "This Is Indian Land". They not only did these great songs justice, but made each and every one their own and took them to all new levels. The Departed rode out a tour of Indian Land, but didn't let the dust settle on their songwriting gear. Soon they were mixing in new tunes every few shows, and before long started to put together the next record "Adventus". This album became more of a true reflection of how the band was structured with two front men with strong vocals of different styles who are both strong lead guitarists. There was also an instrumental only track along with "Hobo" featuring Ragweed/Departed bassist Jeremy Plato on lead vocals. This mix of styles was diverse and amazing, but it will be interesting to see the direction Canada will take the band with the late 2013 departure of Seth James leaving Canada solo on leads. Not long ago, Cody ventured down to Port Aransas with a small crew where he recorded a bunch of solo acoustic material. 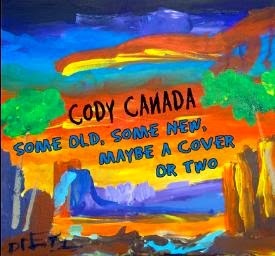 This has been assembled into Cody's first solo album ever titled "Some Old, Some New, Maybe a Cover or Two". You can currently pre-order it through Ragschwag.com which is the electronic store front for 36D Management who manages The Departed and several other class acts in this rich, local music scene. I've hear 2 tracks from this and can't wait to receive my package I ordered from RAGSCHWAG soon!